By Amy Hoover. Published in Pilot Getaways Magazine, 2001. 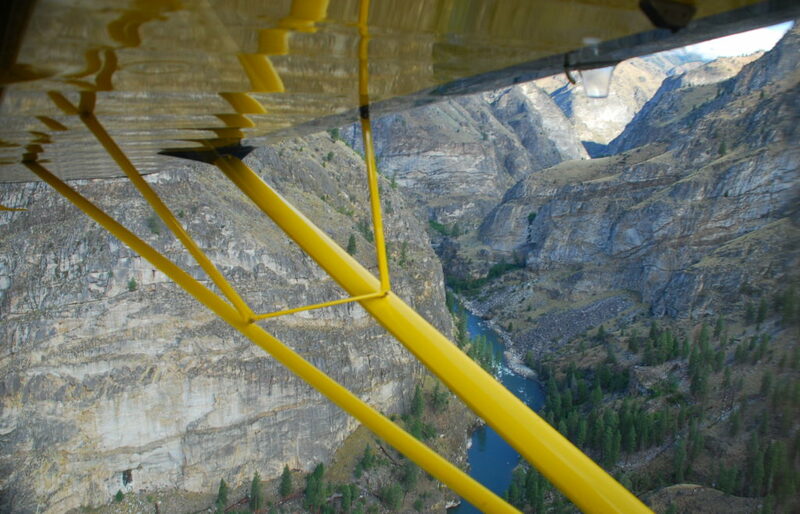 With an understanding of a few basic “rules”, canyon flying can be exciting, challenging, fun, and above all, safe. Flying slowly in a canyon is critical to safe operations because it gives the pilot more time to react and is the best way to decrease turn radius while maneuvering. 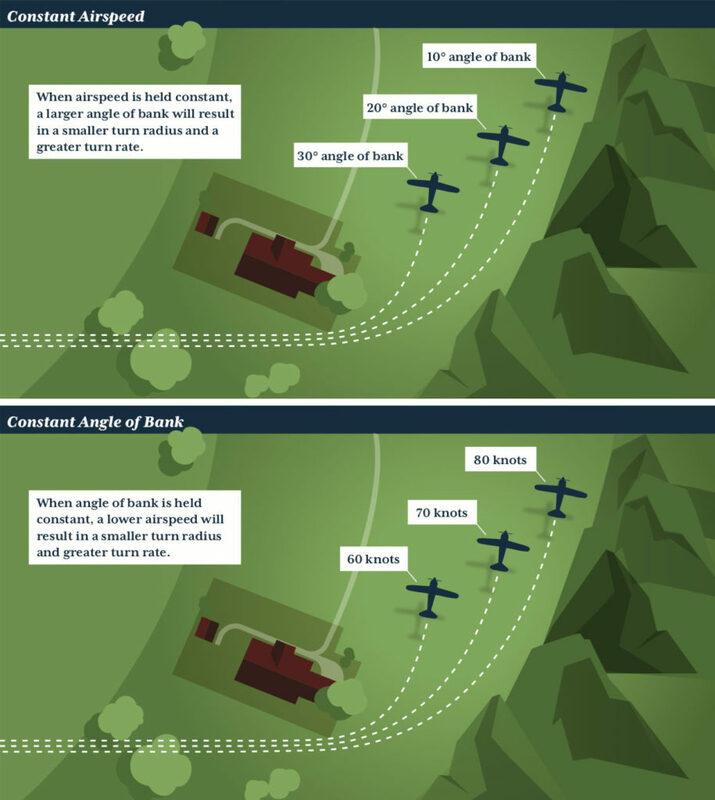 Pilots need to keep their head “out of the cockpit” when flying in canyons and confined spaces, thus it is critical to know the correct power settings to achieve a desired airspeed, such as maneuvering speed (VA), or maximum flap extended speed (VFE). Rattling around in a narrow canyon is not the time to be distracted by hunting for power settings, so pilots should prepare by determining the correct “target” power settings and airspeeds ahead of time. The power required to maintain a given airspeed in level flight depends on weight and position of the center of gravity (CG), with more power required as the airplane gets heavier and the CG moves forward. To determine the correct power settings to use, load the aircraft to the desired weight and CG position and go flying. Maintain altitude while reducing power until the desired airspeed is obtained, and record the power required. Make some medium bank turns at your chosen airspeeds while holding altitude to determine whether additional power is needed in the turns. Keep in mind that the pitch attitude might have to decrease slightly in a turn to maintain airspeed. By determining target power settings in advance, the pilot can slow down to a desired airspeed smoothly and with confidence while maintaining situational awareness in a canyon. At a given airspeed, the steeper the bank angle, the tighter the turn. Tighter turns are needed in confined areas, but steep turns in canyons can lead to many problems, including visual disorientation. In a canyon there may be no horizon to reference airplane attitude, so shallow to medium bank angles greatly decrease the risk of becoming disoriented. Also, increasing bank angle beyond 30° rapidly increases the load factor and stall speed of the airplane (both increase as the square of the airspeed). The best way to avoid disorientation and “pulling G’s” that could stress the airframe and increase your stall speed is to limit bank angles to 30 degrees. By combining these two axioms a pilot can maneuver or turn around in a relatively narrow space. But how much should the airplane be slowed down? For example, suppose a pilot is flying in a canyon and needs to turn around safely to avoid weather, hazards, or to circle over an airstrip to check out the conditions. For operations in canyons more than 3/4 mile wide, VA is generally a good target airspeed in most general aviation aircraft. However, in narrow canyons a good technique is to slow to VFE and extend flaps to stabilize the airplane. Reference the Pilots Operating Handbook to determine the flap setting recommended for a maximum performance takeoff. That setting generally gives the maximum lift to drag ratio for the wing, and is the best flap setting to use for slow flight in a canyon. For most general aviation airplanes, a power setting somewhere around the bottom of the green arc on the manifold pressure gauge will yield a speed between 70 and 90 knots at takeoff flap setting. Use of full flaps is not recommended as it creates a lot of drag and requires more power. When there is a lot of wind or turbulence in canyons, professional pilots are usually back at the hangar drinking coffee. Canyon winds can be unpredictable, and it is generally prudent to avoid flying in high winds or turbulence. Another, possibly not so intuitive, reason is that when flaps are lowered as suggested to slow and stabilize the airplane, the limit load factor of the wing may be drastically decreased. For example, the airplane might be certified for 3.8 positive G’s, but with flaps down may only be certificated for 2.4 G’s. Thus, slowing down and using flaps to maximize safety could compromise the structural integrity of the airframe in turbulence. This means flying along the side, not in the middle, of a canyon and being aware of the “escape route” at all times. In general, try and fly downstream (downhill) in canyons and follow drainages that have large rivers or streams in them; the canyons will be wider and gradients shallower, and the terrain less likely to rise more steeply than the climb performance of the aircraft can handle. The “old and not so bold” bush pilots say, “always have a back door”. These simple rules help to keep a pilot’s hand on the doorknob! The articles and material on this website should not substitute for real flying experience. They are intended to help pilots operate with greater forethought and safety when flying in mountains and canyons anywhere. Like many other disciplines, this type of flying is a lifetime learning process. Although careful study of concepts and techniques is helpful, pilots are encouraged to seek instruction from a qualified and experienced pilot or CFI who is familiar with the area in which they intend to fly.